Its so amazing that I had severe cold and headache for the entire day yesterday and it has just vanished by doing some vigorous Yoga exercises. I know one of my friends who had gall bladder stone, kidney stone and some esophagus infection and was cured by doing Yoga practiced by Baba Ramdev for a week or two. The greatness starts from simplicity. One must learn from him what greatness is. Of course he is not one among us. He works for the nation and for the well bieng of all the human being and all the life forms of earth. It's not too long when I heard about him for the first time. The name Baba Ramdev was unfamiliar to me. When I saw him on T.V I realized its not the first time I have seen him. He had been a popular idol for a very long time. Its just that no news channel has any intention of developing the society. They are just one among the cheap political game. I came to know about him from one of my friends whom I met in a mansion where I lived for few months of last year. 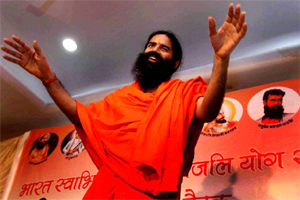 He is a sanyasi who is well versed in Sanskrit, Yoga, Darsana, Vedas and Upanishads. He is famous in News nowadays for his fight against corruption. It is such a shame to the entire nation that the media is questioning him rather finding the culprits. It is very clear from that fact that the media is bribed by the politicians and the bureaucrats.